On top of exposed bedrock is an island of sand. Thirteen people, representing legends, belief systems, mythology and religions, stand on this unstable foundation. The rabbi, the mullah and the bishop can be highly educated theologians, but their knowledge is still limited and uncertain. The emperor, Hirohito, was looked upon as a God. Japanese pilots who were indoctrinated in the suicidal missions of kamikaze were celebrated as half-gods and encouraged by the motto: “If you die for the emperor, you will live forever!” The bell tower is a metaphor for communicating the main idea of this painting: “any belief that commands, condemns and punishes another human being through fear and oppression is not a higher spiritual truth.” A chest behind the figures is a war memorial that reminds us not to return to centuries of senseless killing, while the hands frantically signal the degrees of pain and suffering inflicted and the urgency of the message. 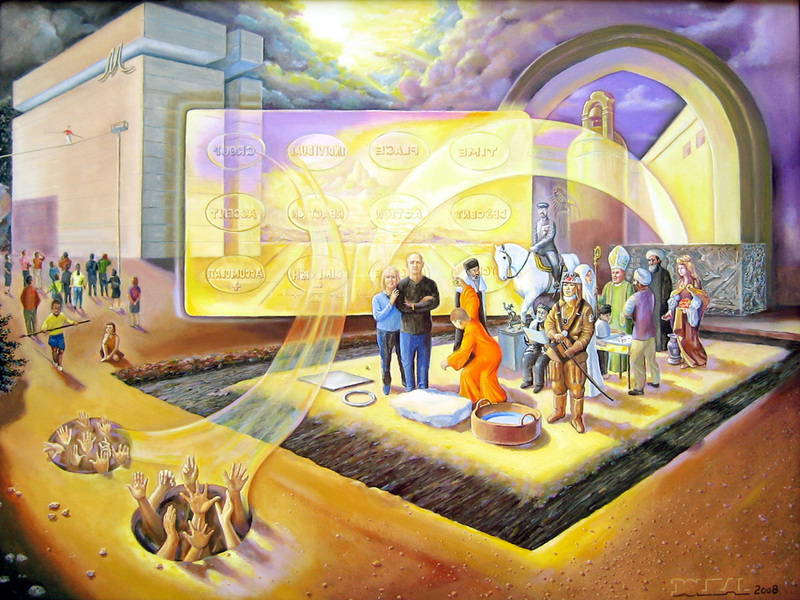 In the center of the painting is the cosmic calculator which analyzes all actions and prints out their consequences. It glorifies every single person as a unique spiritual being. It cannot recognize race, geography, politics, belief systems or social status. Whether a ball is tossed onto a stone tile, in the center of an iron ring, into a soft pillow or into a barrel of water the outcome will be the same, regardless of who threw it.